Are you in love with the Enneagram, well have you ever thought about how it could make your marriage thrive? Today we have the Enneagram Coach, Beth McCord back on the show and we talk about her new book she wrote with her husband. 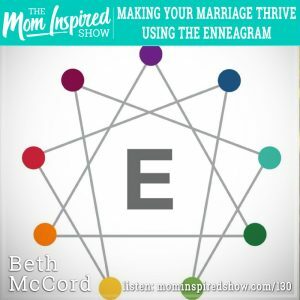 She shares with us that she couldn’t find an enneagram book for married couples that resonated with her. So she wanted to write a book that would be “a wake-up call for couples who feel stagnant, revealing what happens when two people in a committed relationship risk seeing each other from a fresh perspective.” She gives us a glimpse of what she talks about in the book from the importance of doing our own work, and to be understanding and forgiving to our spouse by using the Enneagram. One topic that stood out to me is to not commit “assumicide” but rather ask for clarifying questions and give clarifying statements. Hear what she says about this topic and more on the podcast. Did you know that your skincare is likely filled with ingredients that can disrupt your hormones from parabens to PEGs to sulfates? When I started to look at what I was putting both in and on my body, I was really surprised at the ingredients list that was in the products. Remeverse products are so great and its made its so much easier to get rid of my toxic products.